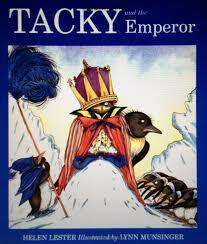 Have you read the “Tacky the Penguin” books with your students? Author, Helen Lester and illustrator, Lynn Munsinger have created this endearing little penguin character who, frankly…..has some challenges reading social cues. I have been working through the Tacky the Penguin books with my students over the past couple of weeks, working on various language skills such as comprehension, comparing/contrasting (with the character, Penguin Pete by Marcus Pfister), story structure/narrative work, and vocabulary. One of the books, “Tacky and the Emperor” particularly lends itself for some opportunities to work on Theory of Mind/perspective taking skills. I created a guide for you to use with this book when targeting 1st order and 2nd order “false-belief” types of perspective taking questions. “First-order false belief” tasks refer to understanding what one person might believe/know/think about a another person. An example from this book might be, “Do Tacky’s companions know that the visiting Emperor is really Tacky?” “Second-order false belief tasks” refer to one’s ability to infer what one person believes/knows/thinks that another person believes/knows/thinks.” This adds another layer to the social understanding. 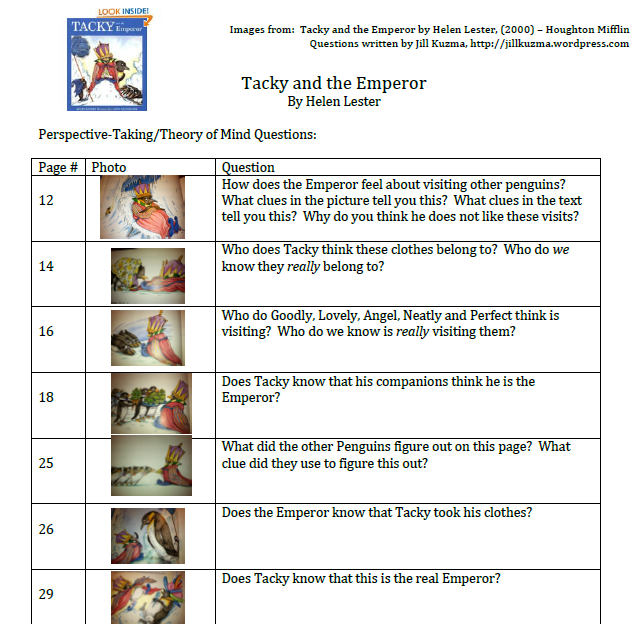 An example of a second-order false belief question from the book might be, “Does the Emperor know that the Penguins found out that Tacky stole the Emperor’s fancy clothes?” Perspective-taking questions with a socially-ladden theme can be a great way to work on higher level inferential comprehension in text, as well as “theory of mind” skills in learners with social cognitive needs. Check out the book from your library, and download the question guide here…Try it with your students this week!